My friend Catherine returned from a visit to the shore with a bag of presents: a cabbage just slightly larger than a basketball and two lovely, large sweet potatoes. I love sweet potatoes, but I must confess that casserole topped with bags of store-bought marshmallows makes me gag. It is tantamount to making a rich, cheddary macaroni and cheese and then topping it with a jar a chezwhiz. 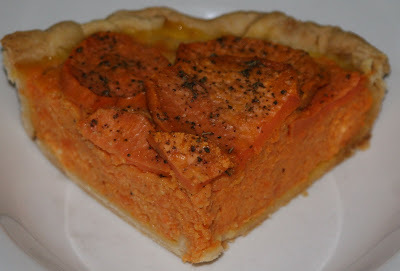 I was looking for a dish that I could make in individual servings that would be textural, not too sweet and would show off the sweet potato. This fall I received an abundance of old fashioned, hard pears. They are divine for preserves, but as it became hard to process them all, I decided to make a batch of pear butter. This was a case where the variety of pear did not evenly match its use. The herbed pear butter with thyme and sage remained a bit gritty. When I got the sweet potatoes, I thought the pear butter would make a nice compliment to some mash. Then I decided to make a savory pie instead. I thought this would be nice to make in large cupcake pans so you could have individual servings, but I made one big pie to try it out. I made a sage oil with some rubbed and fresh sage and set it aside. 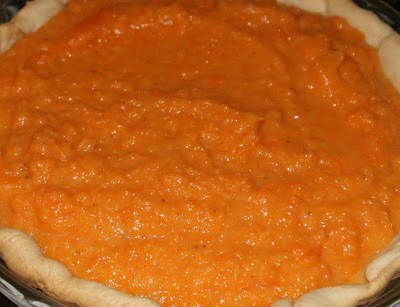 I began roasting the largest sweet potato in a 375 oven and after about a half-hour, I set in a pie crust to blind bake. Next, I peeled and slice the other potato in slices of a bit over 1/4 inch. I laid them on a baking tray and brushed them with the sage butter. When my crust was nicely browned, I pulled it out and checked my baked sweet potato. It was soft, so I took it out and put in my slices. I mashed the baked sweet potato and added about 3/4 cup of herbed pear butter. I added 1/4 cup half-half and two eggs and mixed well. I added the mixture to the pie shell, removed my slices from the oven and laid them decoratively on the top. I put the pie back in the oven and baked it for 45 minutes. It came out fine, but not as savory as I thought. It actually made a lovely dessert pie. I am still thinking of making individual "cups" to serve with a Christmas turkey or maybe just as little snacks. Mix the sage, salt and oil in a small bowl and set aside. Peel and slice one sweet potato. Lay the rounds on a baking sheet and brush with sage oil. 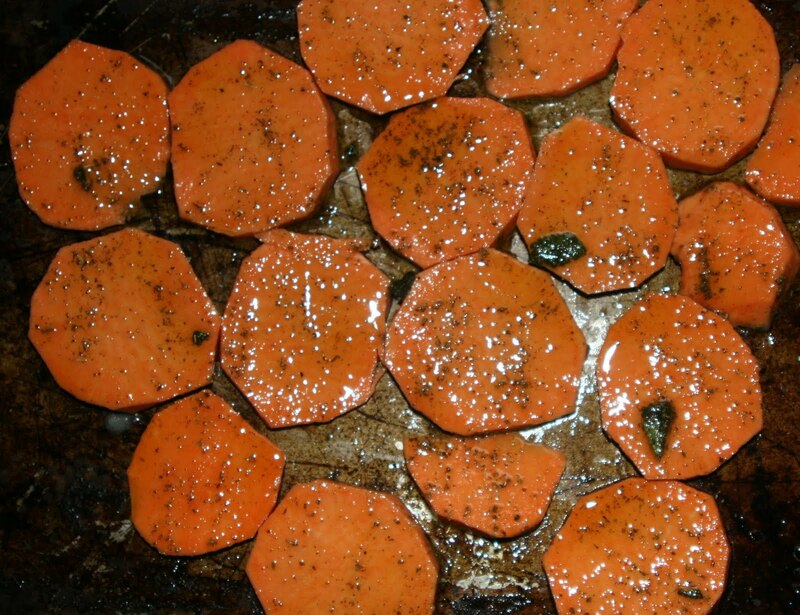 Bake the other sweet potato in a 375 oven for one hour, until soft. Remove the baked sweet potato from the oven and now add the tray of sliced sweet potatoes into the oven. Peel and mash the baked sweet potato. Add the pear butter, half-and-half, and eggs and mix thoroughly. Pour into baked pie shell. Remove the potato slices (they may not be totally cooked, but that is OK). Arrange the slices on the top of the pie. Return pie to oven for about 45 minutes. In the end, these sweet potatoes would not be denied their incredibly rich sweetness. 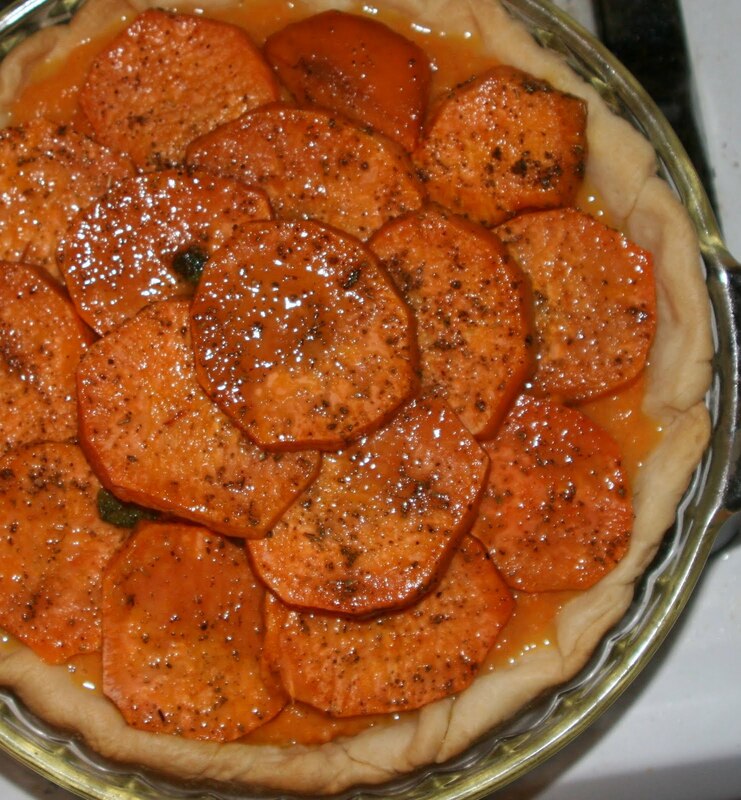 So my savory sides became a sweety pie. What's a girl to do?